VIT University has begun the online application process for VITEEE 2018 from November 01, 2017. The offline application form of VITEEE 2018 will be available from November 9, 2017 at VIT campuses and listed post offices. Aspirants of VITEEE 2018 can check here how to apply for VITEEE-2018 online & offline. VIT University has started online application for VITEEE 2018 on November 01. 2017. However, the offline application form for VITEEE 2018 will be available from November 09, 2017. Students can fill VITEEE 2018 application form in online or offline mode. Candidates seeking admissions to Bachelor of Technology programmes offered at various campuses of VIT University i.e. 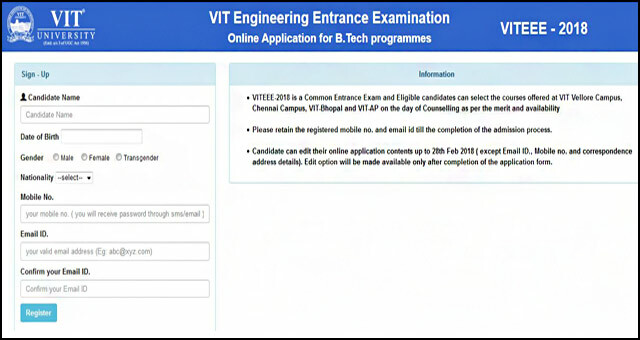 VIT Vellore, VIT Chennai, VIT Amravati and VIT Bhopal can apply for VITEEE 2018 before the last date of application i.e. February 28, 2018. Moreover, students must check the eligibility criteria of VITEEE 2018 and other instructions before filling VITEEE application form 2018. Students also, need to make payment of Rs. 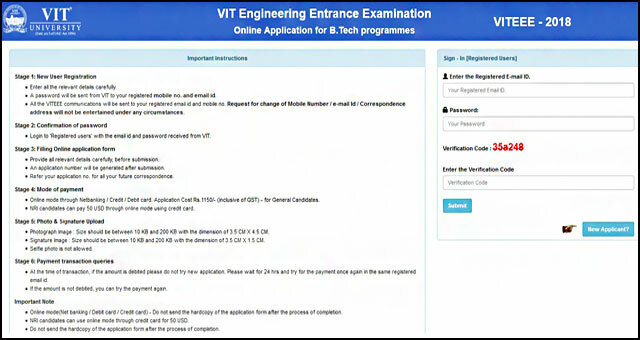 1150 for online registration of VITEEE 2018 and Rs. 1200 for obtaining application form and prospectus of VITEEE 2018 from the listed post offices. Students can check here how to apply for VITEEE 2018 including online registration, uploading documents and submitting the application form of VITEEE 2018. Enter candidates name, DOB, Gender, Nationality, Mobile Number and Email Id for registration. You will recive a password on your registered mobile no. and email id. Login with the registered email id and password as received from VIT University. After registration and login, a candidate has to fill all required fields accordingly and with proper care. After filling all the details, candidate has to submit the forms by clicking on the submit button. Every candidate must review his/her form before submitting to check for the errors. Online Mode – Candidates can pay the examination fee online by using Net banking / Debit Card / Credit Card. The application for VITEEE 2018 is INR 1150. Passport size colour photograph between 10 kb to 200 kb (Dimension - 3.5cm X 4.5 cm) in jpg/jpeg format. Signature of the candidate between 10 kb-200 kb (Dimension - 3.5cm X 1.5 cm) in jpg/jpeg format. VITEEE 2018 Online Application Form - Students can apply for VITEEE 2018 in online mode. Click here to apply. Important note: If a candidate has chosen online payment mode (i.e. through Net banking /Debit Card /Credit Card) then he/she need not to send the hardcopy of the application form or any other document after the submission of the form.